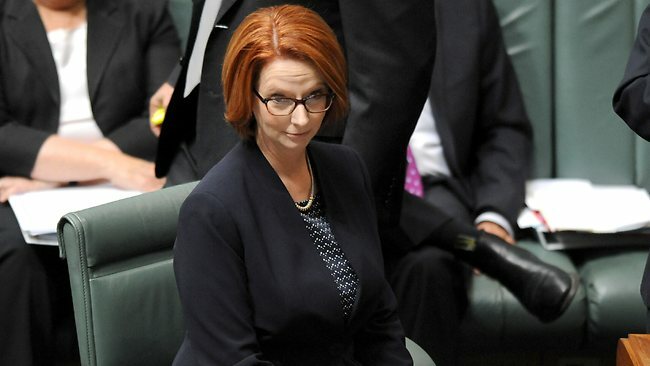 … Julia Gillard “lost the politics”. The explanation had something to do with Abbott’s accepting the Hobson’s Choice she offered him as “allowing Abbott to set the agenda”. It seems that even when she and her government score such an obvious win, they lose. I’m sure that if Abbott hadn’t caved in she would have “lost” because the (inevitable) polls on a levy would have shown it was unpopular with voters. In that magical place called PunditWorld, her only option was to do nothing about the NDIS at all, and then they could have accused her of abandoning the disabled to “another unfunded Labor promise.” That’s the line Tony Abbott and Joe Hockey were running at the start of the week, for what it was worth. If given the option of adjudicating on whether a Gillard political move is “cold and calculating” or “crazy-brave”, the commentators seem to prefer picking the latter. They give her little credit for the ability to calculate politically. And when they do they call it “grubby”. But remember: Abbott did cave in. And in politics, pundit-style, making the other guy cave in is what it’s all about. So, Gillard can’t calculate politically? Let’s briefly examine some of her supposed lack of political talent. 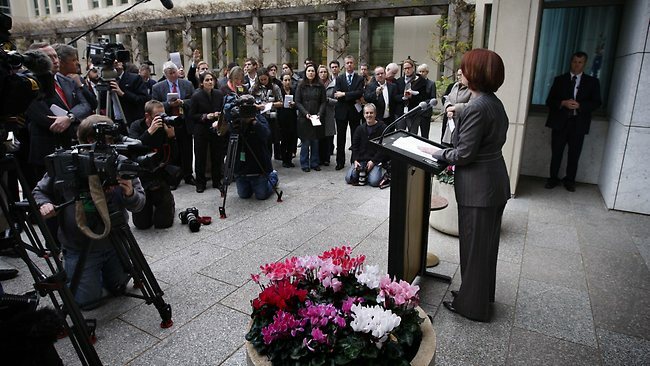 Remember… we are now nearly three years into the first Gillard government. I emphasize the word “government“. Prospered, gazetting nearly 500 pieces of legislation on subjects as diverse as the Mining Tax, Carbon Pricing, Tobacco Plain Packaging, &etc. Has stared down attempts to run plebiscites and “No Confidence” motions on the quality of her government. From a hesitant start in the Foreign Affairs field, has forged epoch-making agreements and alliances with China and won a seat on the UN Security Council. Presided over low unemployment by world standards. Seen interest rates at the lowest they have been in five decades. Scored consistent triple triple-A ratings for the Australian economy, from the three main ratings organizations. In the meantime Gillard has stared down two challenges to her leadership from Kevin Rudd, winning one by the largest majority caucus vote in history, and the other due to a humiliating forfeit by the challenger. On both occasions she allowed him and his supporters to over-reach their meagre political resources and then chopped him off at the knees. During that time she has had to endure endless disloyal leaks, some of them from the Cabinet itself. The leakers, plotters and Rudd supporters have now joined the usurper on the back bench, in obscurity and disgrace. The journalists who constantly predicted her party-room demise have been proven wrong, and a handy gaggle of them have since been retrenched or sacked. Given the circumstances, and indeed in almost any circumstances, the Gillard government – if objectively judged by longevity, outcomes in policy and legislative substance – has been a political success. If politics is about getting into office and staying there, and while there doing worthwhile things, then the Gillard government outplayed both the Coalition and the pundits by a country mile. If politics – in its purest and most cynical form – is about consistently rubbing your critics’ noses into the mud generated by your political manoeuvres, then there are a lot of grubby faces out there. The Gillard government owes its very existence, right from the start, to politics played, and played well. ” It is smart politics, but timid reform. Kenny didn’t discuss the Abbott IR policy seriously, except to distil it into a loose collection of escape clauses that “neutralise” his “IR problem”. Does anyone else see a disconnect between Kenny’s mind and reality here, or is it just me? Key to the assertion that the Gillard government is “bad” on politics – not “patchy”, not “imperfect”, not “up and down”, but “bad” – is the pundit’s world view. The pundit’s world view states that, like a hammer eyeing-off a nail, everything looks like politics. Further, that politics is the only thing that counts. Further, that they alone are uniquely able to judge the nuances of politics, to see beyond the daily grind, revealing true context. The trick is to get their reading and viewing publisc to accept these assertions as not only valid, but as the only valid considerations possible. Only then do we achieve Pundit Nirvana: in PunditWorld a government that is “bad at politics” is not fit to govern. It’s all about the “look” of things. The model for political discussion seems to be Reality TV, along with its kitschy, shallow values, its phoney dramas and sugar-coated emotions. Political discussion is no more sophisticated than that, following the tried and true path of circular logic, barrow pushing by vested interests, insider information and ersatz sensationalism. We are constantly bombarded with pundits’ opinions as to how issues will play among the pundits, expressed in terms of a grammar that only those with The Savvy understand. These opinions are then laundered through public opinion polls produced by the major media organizations, and thence back again to the pundits as allegedly valid data presented patronizingly as “the will of the people”. It’s a beautiful closed loop that requires only trite discussion of policy, drawing principally on personality, populism and proprietorship of the mass media. What Kenny (I think unwittingly) concedes is that we are seeing a death struggle played out between the media and the Gillard government. It’s either the government or themselves who will survive, but not both. Despite the towering edifice of the mass media we are seeing, frankly, the commentocracy’s last throw of the dice. They may never be able to muster the strength to run a similar partisan campaign in the future. Their viewers and circulation are tanking. Their ranks are thinning with thousands of retrenchments having occurred, with more to come. Their political bias outright offends half their readership. The other half views them as being in the same stormwater drain as used car salesmen, financial advisers and grubby politicians (the same politicians they have worked so hard to depict as grubby). Their business models are failing, remaining only as the playthings of their over-paid management and indulgent proprietorship. Their formats are shrinking in size and relevance along with their credibility. Their news is out of date by the time their anachronistic means of production – both linear, and slow – manages to publish it. Wrong on just about everything from leadership challenges, to successful legislation (and all the politicking that goes into it), to the government’s longevity in office, the media have staked on all what amounts to their own vanity, and the spiteful churlishness that arises from it. They are surrounded by chaos in their own world and, like a man with a chronically bad back, can’t understand why everybody shouldn’t feel as miserable as they are. Julia Gillard has not played their game and they’re out to get her for it. They define her success as success at that game, one where they fancy themselves as umpire, linesman, ball-boy and coach, as well as authors of the rules of play. Passengers in their various Titanics, they foolishly believe they’ll be first into the lifeboats, flashing their “Senior Commentator” and “Pundit Class” tickets to get on board without wet feet. They should ask their thousands of retrenched colleagues about life after the mainstream. They’ll find out the mainstream quickly becomes a backwater: a cold creek, empty of promise but full of competition. Perhaps then they can tell us who’s good at politics and who’s not. This time they think they’ve got it all set: the polls are consistently disappointing for Labor, the media speaks with a united voice against her, and her opponent is criticised only in trivial terms, enough to make it appear there is some “balance” at play, but no more. The demise of Julia Gillard is all arranged. But with her tendency to politically outwit and successfully second guess her opponents, allegedly losing every confected battle but still somehow achieving her desired outcomes, the pundits and their paymasters may yet be due for another big disappointment. It’s a fight to the death we’re seeing, between group-thinking, insular hacks and one of the great political achievers of our time. Great last too. HoJo becoming the voice of sense in the Coals shows how out there they have become. .